Objetivo: Determinar el comportamiento de la glucosa mediante monitoreo continuo de glucosa (MCG) en pacientes diabéticos tipo 2 en hemodiálisis (HD) bajo tratamiento con insulinas en el Hospital de San José - Unidad Renal Fresenius Medical Care. Materiales y métodos: Estudio descriptivo longitudinal. Se incluyeron, desde abril hasta agosto de 2016, pacientes con diabetes tipo 2 con falla renal en HD tratados con insulinas. Se midieron como variables de interés: hipoglucemia grave, severa o asintomática, hiperglucemia, variabilidad glucémica, características demográficas y paraclínicas. Conclusiones: El MCG en pacientes diabéticos en HD detectó alta variabilidad glucémica, hiperglucemia que predominó en los días de no diálisis y mayor número de hipoglucemias comparándola con la toma de glucometrías. Instructor Asociado Servicio de Endocrinología. Fundación Universitaria de Ciencias de la Salud FUCS – Hospital de San José. 1. Federación Internacional de la Diabetes. Atlas de la diabetes de la FID. 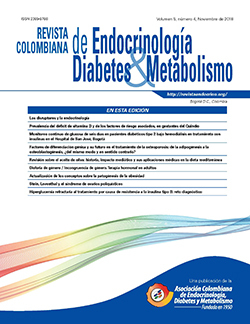 Federación Internacional de la Diabetes; 2015. p. 144. 2. Fondo colombiano de enfermedades de alto costo. Situación de la enfermedad renal crónica en Colombia 2015. Colombia: Fondo colombiano de enfermedades de alto costo; 2015. p. 152. 3. Sego S. Pathophysiology of diabetic nephropathy. Nephrol Nurs J. 2007;34(6):631-3. 4. Oomichi T, Emoto M, Tabata T, Morioka T, Tsujimoto Y, Tahara H, et al. Impact of glycemic control on survival of diabetic patients on chronic regular hemodialysis: a 7-year observational study. Diabetes Care. 2006;29(7):1496-500. 5. Ishimura E, Okuno S, Kono K, Fujino-Kato Y, Maeno Y, Kagitani S, et al. Glycemic control and survival of diabetic hemodialysis patients--importance of lower hemoglobin A1C levels. Diabetes Res Clin Pract. 2009;83(3):320-6. 6. Hill CJ, Maxwell AP, Cardwell CR, Freedman BI, Tonelli M, Emoto M, et al. Glycated hemoglobin and risk of death in diabetic patients treated with hemodialysis: a meta-analysis. Am J Kidney Dis. 2014;63(1):84-94. 7. Lim AKh. Diabetic nephropathy - complications and treatment. Int J Nephrol Renovasc Dis. 2014;7:361-81. 8. Sobngwi E, Ashuntantang G, Ndounia E, Dehayem M, Azabji-Kenfack M, Kaze F, et al. Continuous interstitial glucose monitoring in non-diabetic subjects with end-stage renal disease undergoing maintenance haemodialysis. Diabetes Res Clin Pract. 2010;90(1):22-5. 9. Skubala A, Zywiec J, Zełobowska K, Gumprecht J, Grzeszczak W. Continuous glucose monitoring system in 72-hour glucose profile assessment in patients with end-stage renal disease on maintenance continuous ambulatory peritoneal dialysis. Med Sci Monit. 2010;16(2):CR75-83. 10. Jung HS, Kim HI, Kim MJ, Yoon JW, Ahn HY, Cho YM, et al. Analysis of hemodialysis-associated hypoglycemia in patients with type 2 diabetes using a continuous glucose monitoring system. Diabetes Technol Ther. 2010;12(10):801-7. 11. Kazempour-Ardebili S, Lecamwasam VL, Dassanyake T, Frankel AH, Tam FW,Dornhorst A, et al. Assessing glycemic control in maintenance hemodialysis patients with type 2 diabetes. Diabetes Care. 2009;32(7):1137-42. 12. Gai M, Merlo I, Dellepiane S, Cantaluppi V, Leonardi G, Fop F, et al. Glycemic pattern in diabetic patients on hemodialysis: continuous glucose monitoring (CGM) analysis. Blood Purif. 2014;38(1):68-73. 13. Joubert M, Fourmy C, Henri P, Ficheux M, Lobbedez T, Reznik Y. Effectiveness of continuous glucose monitoring in dialysis patients with diabetes: the DIALYDIAB pilot study. Diabetes Res Clin Pract. 2015;107(3):348-54. 14. Seaquist ER, Anderson J, Childs B, Cryer P, Dagogo-Jack S, Fish L, et al. Hypoglycemia and diabetes: a report of a workgroup of the American Diabetes Association and the Endocrine Society. J Clin Endocrinol Metab. 2013;98(5):1845-59. 15. Medtronic MiniMed. Guía del usuario ipro2. Northridge California: Medtronic MiniMed; 2010. p. 117. 16. Fresenius Medical Care. Online Clearance Monitoring Assuring the Desired Dose of Dialysis,. Germany: Fresenius medical care; 2007. p. 28. 17. Fresenius Medical Care. Glosario de productos y servicios Mexico [cited 2017 15 de Febrero]. Available from: http://www.fmc-ag.com.mx/glosario.html. 18. Stevens PE, Levin A, Members KDIGOCKDGDWG. Evaluation and management of chronic kidney disease: synopsis of the kidney disease: improving global outcomes 2012 clinical practice guideline. Ann Intern Med. 2013;158(11):825-30. 19. Chantrel F, Sissoko H, Képénékian L, Smagala A, Meyer L, Imhoff O, et al. Influence of dialysis on the glucose profile in patients with diabetes: usefulness of continuous glucose monitoring. Horm Metab Res. 2014;46(11):810-3. 20. Meglasson MD. Patent Number: 5,132,324. Use of 3-guanidinopropionic acid in the treatment of non-insulin dependent diabetes mellitus (niddm) United States1992. 21. Eloot S, van Biesen W, Dhondt A, de Smet R, Marescau B, De Deyn PP, et al. Impact of increasing haemodialysis frequency versus haemodialysis duration on removal of urea and guanidino compounds: a kinetic analysis. Nephrol Dial Transplant. 2009;24(7):2225-32.